As we embark on our XTime Expediton 2018, we will be hunting for treasures to bring back for our XTime Family. Once we return from our exploration, we will auction off these treasures so that proceeds will be donated to our XTime Family Club. In a few more days, our view of the world will change. We will see places we've never dreamed of, and people and cultures that we've never imagined. So, gear up and mark your calendars, the countdown has begun. This all started in May of 2016 in the Sin city Las Vegas. We were having Dinner at Emie Pawiks house and all of a sudden somebody said "Where and when is the next reunion?" I thought, well, next one should be an adventure instead of just eating and drinking. So, I shouted "How about Alaska Cruise in 2017 and European Cruise in 2018?!!!". Well, it looks like it stuck to everybody's mind. Then lots of our friends started to message me asking for it. Well then I asked, "Why not a big reunion where everybody will have fun and memories. Let's go for a European Tour and a Mediterranean cruise?". Then the rest is history. I do not know why I end up being the Tour organizer, planner, guide, accountant and everything! 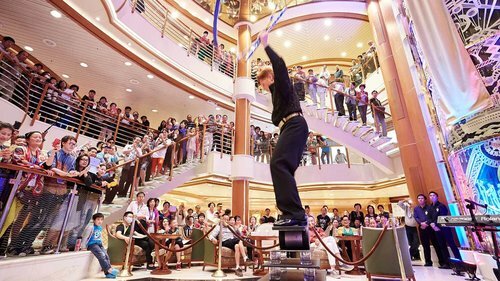 Recommended Cruise Activities For The Young And The Restless. Note that these activities must be approached with an open heart, open mind, and open eyes... but not necessarily with an open wallet. There's a lot of activities and entertainment that are free, and all you'll have to do is to show up. It is much more fun to go in groups, and have someone to share the laughter with so that someday when you grow old you will have someone to swap stories with. 1. The Piazza which has a daily entertainment before dinner time. 2. The Movies Under the Stars which comes with free pizza and popcorn. 3. For the dancerous kind who wants to dance the night away, there's a superb disco at the Skywalker's NightClub. 4. The Lotus Spa Fitness center is a good way to expend excess energy. 5. If exercising is not enough, there's always the pool and the sports courts. Imagine playing on the green while surrounded by a beautiful blue ocean. Whether you’re a dabbler or a devoted disciple of the game, our nine-hole miniature putting course will put your finer golfing skills to the test. After you play a round, step inside to try your hand at our golf simulator, which recreates some of the world’s greatest golf courses like St. Andrews and Pebble Beach. JUST FOR KIDS 8-12 YEARS OLD. JUST FOR TEENS 13-17 YEARS OLD. Recommended Cruise Activies For The Young At Heart and the Restful. 1. Princess Theater which has a daily evening show around 8 PM. it's a nice go to entertainment after dinner. 2. The Piano Bar which is open daily until midnight, is a nice go to entertainment right after the evening shows. 3. For those who love to do some light dancing, there are also some nightclubs with live music entertainment. 4. There is also some entertainment going on daily at The Piazza usually before dinner time. 5. The afternoon tea around 3 or 4 PM is not to be missed, it's a good way to meet new people.